A couple of days ago I had the opportunity to attend a Brown Bag Lunch of the World Bank Institute WBI entitled ‘Open Information Solutions for the Urban Poor’. During an hour and a half four speakers advocated the use of Information and Communications Technologies ICT for development or what they call ICT4D. While, being a user of many ‘Aps’, I was aware of the endless applications that open information solutions had in developed countries – where there is a high access to information technologies – , however, their use in urban contexts in developing countries seemed to me distant and complex. It took me only an hour to change my mind. I guess my ignorance of the opportunities that ICTs had for development issues came from my ignorance of the recent exponential growth of some ICTs in developing countries. While Internet is still a rare commodity in developing countries – only 11% of Africans and 24% of Asians have access to it – mobile phones have been democratized much faster than any other ICT. Since 2002, mobile penetration has grown by 321% in emerging economies compared to 46% in developed countries. Africa, the least developed continent, had only 17 million mobile connections in 2000 and has today around 620 million, corresponding to 60% of the population. But the democratization of some ICT in developing countries is only a part of the equation, how can basic information technologies help to tackle developing issues? Today, most of the open information solutions used in developed countries are based on spatial applications that require GPS and mobile access to the internet. Smartphone applications like Yelp or Poynt – that can point you to the nearest and best reviewed restaurant – are based on information made by users for users, most of which have either smartphones or an internet connection. With only the most basic mobile technology, open information solutions in developing countries have to very creative and simple. 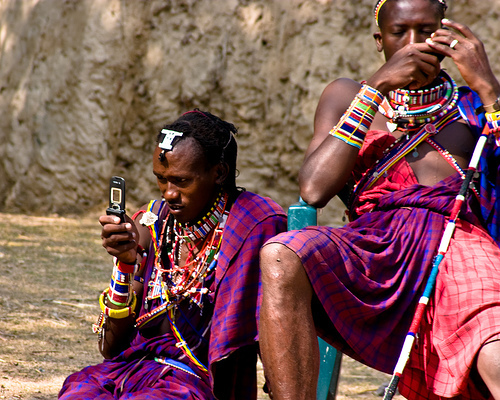 In fact, some of the most widely used Open Information technologies in developing countries rely on simple SMS. M-PESA, an SMS-based money transfer system in Kenya allows individuals to deposit, send, and withdraw funds using their cell-phones. The latter, is currently used by 40% of Kenya’s adult population, most of who live in cities and use it as a cheap and easy way to transfer money to their families in the country-side. Very similar SMS applications are emerging in many other developing economies – like Brazil and Bangladesh – to improve citizen’s participation in participatory budgets, give service delivery feedback, etc. In Mexico, two entrepreneurs (Oscar Salazar and Jorge Soto) have developed CitiVox, in which citizens reports are transformed into actionable information. One of their first applications used citizens’ report on crimes in Mexico to produce real-time information that could serve to inform other citizens and the authorities. I guess that my very short Brown Bag Lunch opened the ICT4D Pandora box and made me realize that, as in many other cases, you don’t need the most exclusive and expensive tools to tackle development issues but an open mind and a lot of imagination (i.e. see Esther Duflo’s work on Developmen Economics at TED http://www.youtube.com/watch?v=Fuhm7H-3y9M). Could you clarify what you mean by the democratization of mobile phones? I met someone who was working on a World Bank project in Rio’s favelas, a mobile phone banking initiative, and it seemed legit. It is clearly helpful for folks who might not have access to computers and internet 24/7 to be able to transfer money by phone (assuming ‘access’ to a bank account). Integrating the urban poor into the economic market using technology is practical and a good thing to do (? ), but I’m hesitant to think of it in democratic terms. Hi Tucker, the term democratization of technology has been used by a number of people to explain gains in access to technology to a higher number of the population. So it is a little different from the traditionnal use of the word Democracy or democratic and has more to deal with a higher or generalized access. ← ON YOUR MARK…GET SET…STOP!